We invite prospective students to visit the Law School, and we encourage those visits when classes are in session. A visit allows prospective students and their guests to get a true sense of the school’s atmosphere, faculty, and students. During a typical visit, prospective students have the opportunity to attend a small-group admissions information session, tour Mondale Hall with a current student, and observe a class (optional). Register for a visit. We encourage admitted students to visit the Law School when classes are in session to get a true sense of the school’s atmosphere, faculty and students. If you are an admitted student, contact the Office of Admissions at jdadmissions@umn.edu to schedule a visit, or sign up for an available date on the admitted student website. Prospective LL.M., S.J.D. and M.S.P.L. students should connect with their degree program contacts for information on visiting the campus and Law School. The University campus offers commanding vistas of the Mississippi River. In the springtime, Northrop Mall is a lush and sunny place to study or relax. Winter can be chilly, but there’s nothing quite like the beauty of a fresh snowfall. TCF Bank Stadium is the home of Golden Gopher football. Canoeists paddle the Mississippi on a perfect spring day. A quiet morning on campus, every tree etched with frost. The Washington Avenue Bridge connects the East and West Bank campuses. Light rail connects the University with downtown Minneapolis and St. Paul, the airport, and the Mall of America. Beloved University mascot “Goldy Gopher,” sculpted in bronze and granite. The University's Carlson School of Management is a short walk from the Law School. 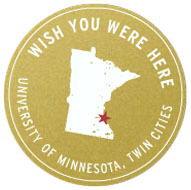 Watch the University of Minnesota’s “Wish You Were Here” slideshow.